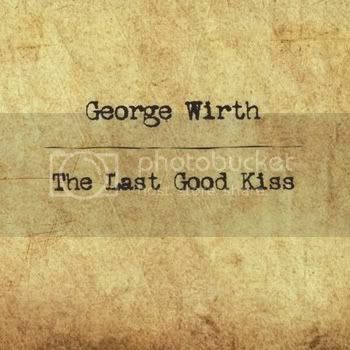 On The Last Good Kiss, George Wirth is generous with his music. I’ve gotten plenty to of albums with just over a half hour of music on them, but this is twice that. The arrangements are spare, with voice and guitar featured, and other instruments adding light touches. There is one duet, Dreamland, and Make You My Home has a few lines of female background vocals. Add to that the fact that George Wirth is limited as a singer. He is not a young man, and his voice has a lot of weather in it. So he can’t belt it out, and his range is probably more limited than it once was. All told, this album could feel long indeed, but it doesn’t. Wirth knows exactly what he can and can not do, and he makes the most of his gifts. And his writing is brilliant. Wirth plays acoustic guitar, which he plucks or strums. He doesn’t take solos or try to wow the listener, but he knows what each song needs, and he supplies it. Abbie Gardner of Red Molly adds lap steel to one song and dobro to another. Amanda Shires plays fiddle on two songs. Dreamland has a dobro part from Jim MccCarthy and duet vocals from Janey Todd, who wrote it; Todd also adds a brief recorder part at the end. So that’s five songs with guest musicians, and the album has fourteen songs in all. Wirth plays harmonica here and there, and he adds a couple of unusual instruments as well. That’s Alright has a Papoose on it; this is a small-scale guitar which sounds something like a mountain dulcimer here. And Heaven’s Gate has a synth harmonium in the background. Taken together, Wirth seems to know that this is a long album which needs some variations in sound from song to song, but the focus his still on the guitar and vocals throughout. As I said, Wirth’s voice has a lot of weather in it. He sings in a gruff baritone with a definite scratch in it, and sometimes he speaks a few words before returning to the melody. He knows better than to force it, so this all sounds completely natural. Janey Todd has a smooth and breathy voice, so it’s surprising how well their voices blend on Dreamland. But the important thing to know about Wirth’s vocals is that, as with his guitar playing, he won’t wow the listener, but he puts across all of the varied emotions in his songs beautifully. In his writing, Wirth expresses the complex feelings of an older man, so this is key to the album’s success. The album opens with I Will Not Go Down Easily This Time, and Wirth takes the voice of Jesus to talk about what He sees at the Second Coming. Weight of Sin also has Jesus as the main character, but has more of the feel of a parable. And religious feelings also surface in Heaven’s Gate and Easter. But this is not a religious album, and in fact, Wirth expresses ambivalence about his faith in the course of the album. Certainly, he never gets heavy-handed or preachy. In Your Arms is a love song, but this is a love that has lasted a while, and the song also expresses amazement and gratitude. The Last Good Kiss is as fine a piece of writing as I have encountered this year. The narrator here contemplates a lost love as he operates a snow play. The musical setting is fairly tranquil, but Wirth’s words had me feeling the winter wind blowing, and the metaphor really works. Dreamland is the only song here that Wirth did not write, but it is fine choice to stand along side his originals. As performed here, the song is dialog, and a beautiful expression of yearning. The other thing to note about George Wirth’s writing is that it evokes a strong sense of place. Most of the songs are set at the New Jersey shore, particularly Asbury Park. I’ve been there as a visitor, but Wirth gives a voice to the townies. These characters are not idealized, but Wirth feels for them, and the listener can not help but do so too. Sometimes the sea breezes blow away their dreams, or the tide carries them back to a place they though they had left behind, but Wirth always gets you to do more than pity them. And you want to celebrate their successes. Above all, I think this is what comes through on this album. These are real people with complex emotions, and they matter. I suppose that means that this is folk music, and a fine example of what it should do. I will be keeping an ear out for more of George Wirth’s music in the future, and I hope to share that with you when it happens. Ooo, good one. This is one of the few reviews I've ever read in which the writer allows the Artist to shine and manages to twinkle a little themself. Being of a similar age myself, I sort of wish Oliver didn't mention George's age quite so much and yet it's a relief and a treasure that he does bring forth the idea that we can be old(ish?) without being stuffy and it's about time somebody had the balls to mention that. I love the line about how George gives us townies a voice - so true and no mean feat there. Lastly, love to George for being the wonderful writer he is and to Oliver for recognizing it.